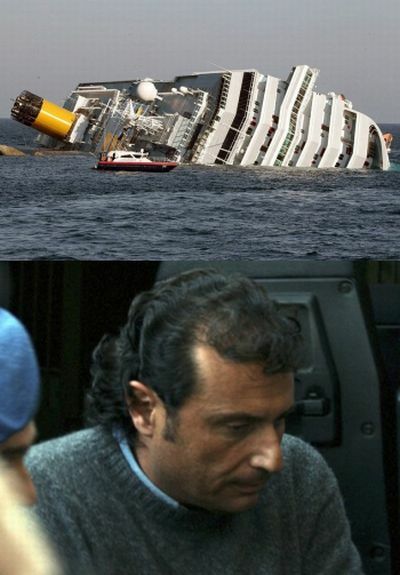 RNC Chairman Reince ‘rent a boy’ Priebus compared President Obama to Francesco Schettino, the Italian cruise ship captain who took off in a lifeboat after his ship ran aground at Isola del Giglio, Tuscany and is suspected of multiple counts of manslaughter. “In a few months, this is all going to be ancient history,” Priebus said in response to a question about the brutal GOP primary, “and we are going to talk about our own little Captain Schettino, which is President Obama who is abandoning the ship here in the United States and is more interested in campaigning than doing his job as president.”. “If we continue to talk about creating good jobs in this country, and continue to show that Barack Obama has actually been an absolute failure when it comes to jobs – except for, obviously promoting the, you know, securing his own job – I think we do very well in that community. 1) The economy under Obama’s watch has created 2 million new jobs in just TWO YEARS – already more than the GOP created in EIGHT YEARS under President Bush. 2) The last time the GOP controlled the White House, the American economy was marked by the weakest job and income growth in six decades, losing ground on “every major measurement” of economic strength. 3) Though though nary a week passed in 2010 without Boehner asking the president about jobs, the House under his leadership has barely mentioned the word.